Newark Mayor Cory Booker, Lloyd Blankfein of Goldman Sachs, Eric Schmidt of Google and Nicolas Berggruen of Berggruen Holdings, were on site in Newark, N.J., Thursday for the groundbreaking of Teachers Village, a mixed-use development that will include three charter schools, more than 200 moderately priced apartments for Newark teachers and various retail establishments. Richard Meier, an architect who was born in Newark, devised the plan. The RBH Group is the lead developer. 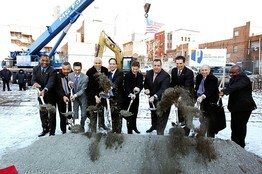 The groundbreaking of Teachers Village in Newark on Thursday. Mr. Meier is also working with Mr. Berggruen, a major partner in this project, on the tallest residential tower in Tel Aviv as well as a group of houses in Turkey. Goldman Sachs is an investor in Teachers Village, and Mr. Schmidt is on the board of Mr. Berggruen’s think tank. “I love the idea of cities growing and renewing themselves,” he said. “Nothing is more interesting than a city that’s transforming and growing.” This first phase of Newark’s transformation encompasses 400,000 square feet; Mr. Berggruen said there is enough land to develop six million square feet.